While a guest at Casa Escondida Bed & Breakfast, experience Santa Fe on a motor scooter! Casa Escondida is a Santa Fe area B&B, which is located in historic Chimayo, NM (just 35 minutes north of Santa Fe). Picturesque Santa Fe is a common vacation daytrip-destination from Casa Escondida B&B. There is so much to see and do in Santa Fe. A motor scooter rental can provide you with an effortless and enjoyable way to get around our historic town, during your Santa Fe vacation. The folks at “Scoot Over Santa Fe” claim that if you can ride a bike, you can scoot! You can rent you a 2013 motor scooter for as little as $3.29 an hour (based on a 24 hour rental). Your rental pricing depends on the overall length of your rental period. Helmets are available for rent as well. Scooting is fun, easy and it does NOT require a motorcycle license. You will love the fact that you can arrive in Santa Fe and then leave your car and the multiple parking fees behind! Shopaholics need not worry. These motor scooters have two storage compartments that are ideal for storing your treasures that may you my purchase throughout your day of Santa Fe sightseeing. Sure, the walking tours of Santa Fe are great but a motor scooter rental can allow you to explore even more of Santa Fe and its’ many galleries, museums, restaurants, historic streets, shops (and more) with great ease. Scooters can be parked virtually anywhere during your Santa Fe adventure. These motor scooters can carry one driver and up to one passenger. Drivers must have a valid driver’s license or a learner’s permit but a scooter passenger can be any age. Scoot Over Santa Fe can also assist you in planning your route, so that you won’t miss a single element of what Santa Fe has to offer. Summer isn’t over yet but keep in mind that the motor scooter rentals are only available from April – October. You can also visit the Scoot Over Santa Fe website for coupon savings for your motor scooter rental. So when you wonder about things to do during your New Mexico travels, put a self-guided, Santa Fe motor scooter tour on your list. It is a wonderful way to experience Santa Fe and all that it has to offer. Casa Escondida Bed & Breakfast is a delightful New Mexico retreat, which has rooms available year-round. We are perfect for a romantic New Mexico getaway too. Contact Casa Escondida B&B to check room availability or to inquire about a reservation. Casa Escondida Bed & Breakfast is a green bed & breakfast, which provides pet-friendly lodging in 4 of our 8 guest rooms. 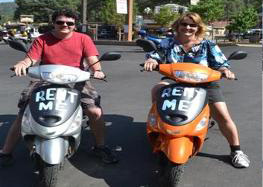 Enjoy your New Mexico travels AND the your motor scooter rental in Santa Fe! We look forward to having you as our guest.